A legend of San Francisco, created in 1928 and just as delicious and mouth watering today, as it was on its creation day nearly 100 years ago. In 1928, a celebrated San Francisco tradition began. George Whitney placed a scoop of creamy vanilla ice cream between two freshly baked large old-fashioned oatmeal cookies, and then dipped the sandwich into fine dark chocolate. The delicious combination of savory sweetness was declared by all to be “IT!” That how the IT’S-IT Ice Cream Sandwich was born and got its unforgettable name, being sold in droves exclusively in San Francisco’s own legendary Playland-at-the-Beach for over four decades. 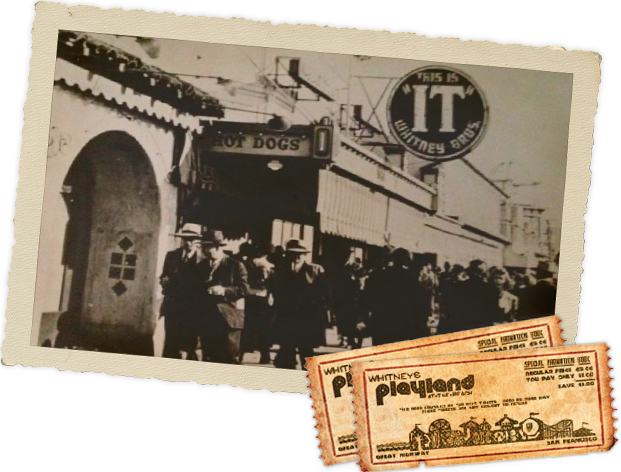 When Playland was demolished in the early 1970s, IT’S-IT sandwiches began being individually handmade in a small shop in San Francisco’s SOMA district under new ownership. The hunger for IT’S-IT exploded. 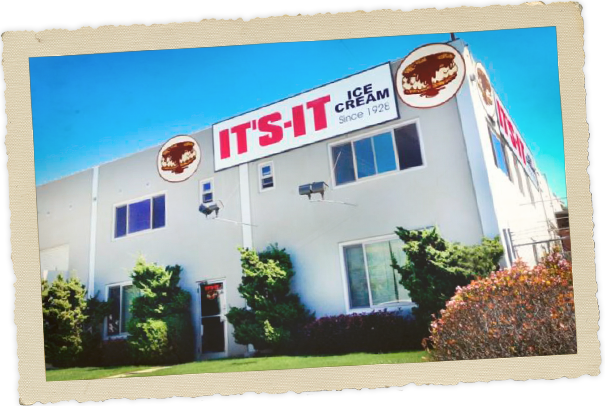 In order to quench San Francisco’s craving for our remarkably tasty ice cream treat, the company relocated to a larger facility in 1976. In the 1980s, the demand for IT'S-IT grew outside of the Bay Area. 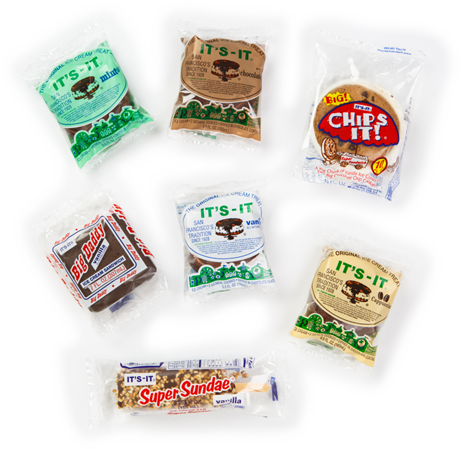 Currently, IT'S-IT Ice Cream Sandwiches are now enjoyed widely in California, Nevada, Oregon, Washington, Hawaii, Arizona, Texas and New York. Via our website, it is now available to be shipped throughout the United States. The growing fan base of diehard enthusiasts for this San Francisco specialty has not gone unnoticed. Most travel guidebooks to this beloved American city urge tourists to "experience" IT'S-IT. Recently, the new IT'S-IT Factory Shop located minutes from the San Francisco Airport, where all delectable flavors are always available, has become a popular destination spot for Bay Area locals and visitors. IT'S-IT has been featured in the New York Times, the Wall Street Journal, the San Francisco Chronicle, Bon Appétit Magazine, CBS's Eye on the Bay, the Food Network's "Unwrapped" among many others. It was deemed "the real San Francisco Treat" on Huffpost Taste. Several generations have savored our IT'S-IT. Throughout the years, the taste of this delectable treat remains the same as it did during its creation in 1928. Maybe that's why the iconic IT'S-IT was named a San Francisco experience. Where can I find IT'S-IT Ice Cream Sandwiches? IT'S-ITs can be found at most major Retailers in the States West of the Rockies. For a full list click here. Does IT'S-IT conduct Factory Tours? Unfortunately, there are no tours of the Factory. However, there is a Factory Retail Shop, which sells all of our products, including hard to find flavors, other exclusive frozen treats, and IT'S-IT memorabilia. Can I get a case with mixed flavors? Yes, you can mix and match a case of your favorite flavors at our Factory Shop in Burlingame IN PERSON ONLY. However, for all preorders, deliveries, and overnight express orders, there is only one flavor allowed per case. Do any of your products contain any nuts? Yes, our Super Sundae contains peanuts. Additionally, all of our products are produced on equipment that also produces peanut and other tree nut products. Does IT'S-IT Ice Cream contain any trans fats or high fructose corn syrup? Does IT'S-IT donate ice cream for non-profit events? IT'S-IT Ice cream actively participates in many events throughout the Bay Area. If you are a non-profit organization in the Bay area, please call our main office and we will be happy to discuss ways in which IT'S-IT Ice Cream can be at your event. How did the IT's-IT get it's name? George Whitney placed a scoop of creamy vanilla ice cream between two freshly baked large old-fashioned oatmeal cookies, and then dipped the sandwich into fine dark chocolate. The delicious combination of savory sweetness was declared by all to be "IT!" 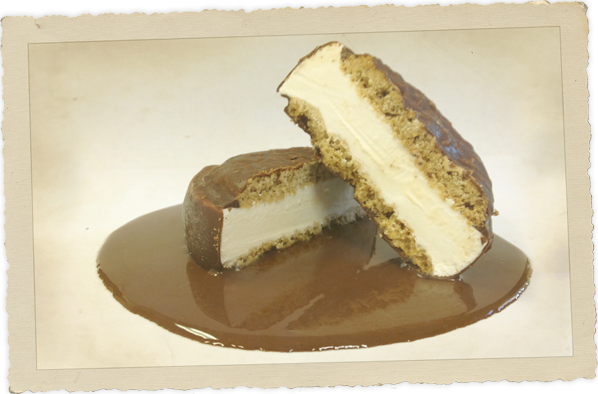 That how the IT'S-IT Ice Cream Sandwich was born and got its unforgettable name. Can IT's-ITs products be shipped to my home? Yes, We ship our ice cream overnight throughout the entire continental U.S. To order click here. Yes, we can deliver (an eight case minimum) to your event if you are within one of the counties listed here.